In a technology-laden desert world in danger of extinction, 15-year-old Zarya holds the key to saving her planet. Headed by a brutal military, Cydnus is a desert wasteland where everything is under surveillance and everyone is controlled, whether they’re aware of it or not. It’s a fact Zarya knows all too well – when her father dared to question Gerik, the planet’s sadistic chief military officer, he was silenced immediately—and Zarya hasn’t heard from her parents since. When Zarya uncovers a deadly plot to release a lethal weapon against the people of Cydnus, she knows she has to act, and fast. Her father’s vast intelligence and knowledge of the technology this weapon uses are exactly what she needs to bring the military down, and for good. Equipped with Sochi, her AI-powered flying airboard, and with her high school friends in tow, Zarya sets out on a journey to find her family, stop Gerik, and save her home from certain destruction. 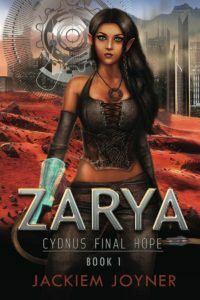 ZARYA, CYNDUS FINAL HOPE, brings readers a stunning battle of good versus evil, and a strong female heroine like no other!